Legendary U2 frontman Bono recently lost his voice during a performance in Berlin. And shortly after that, one of his contemporaries, Dave Grohl, who is the lead singer of the rock band Foo Fighters, lost his voice and was forced to reschedule shows for his tour. (As you may already know, mono, short for mononucleosis, is a virus often referred to as the “kissing disease.” The virus can also be spread through sharing utensils and drinks. It is less prevalent than the common cold and usually not life-threatening). Grohl took part in the joking. “That’s the last time I ever make out with Bono,” he said. And, luckily, Bono appears to be okay and in good spirits despite having to abruptly stop his show. He seems more concerned about his fans. 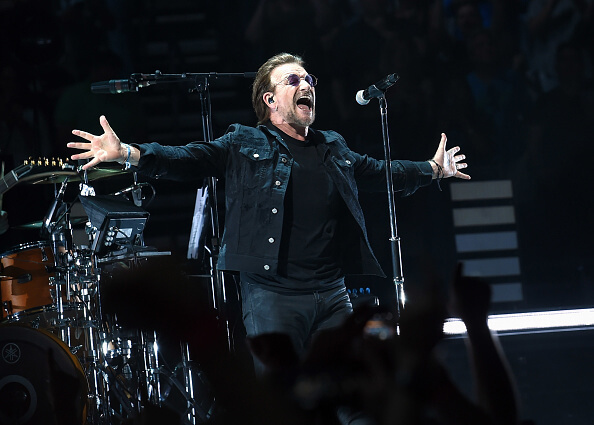 “So happy and relieved that anything serious has been ruled out," Bono said in a statement, according to one CNN report. Bono believes that it was the smoke in the arena where he was performing that affected his voice. “This is like being in a cigar,” he said. (You can watch a video here of what transpired). Certainly, the effects of smoking and being around smoke can affect your voice by causing inflammation and irritation. And you also don’t need to be a professional singer in order to lose your voice. Approximately 18 million adults in the U.S. report problems with their voice. Some of these disorders can be avoided by taking care of your voice. So Let’s Discuss How to Be Proactive About Protecting Your Voice. But first, a general understanding of how you even have a voice may be helpful. “The sound of your voice is produced by vibration of the vocal folds, which are two bands of smooth muscle tissue that are positioned opposite each other in the larynx,” according to the National Institute on Deafness and Other Communication Disorders (NIDCD). NIDCD also reports that if your voice is constantly raspy and you have difficulty speaking, you need to be examined by a doctor to determine what the exact issue is. We all may temporarily lose our voice to an ailment such as strep throat, but there are several other medical issues that can affect your voice. And if you have some difficulty with your voice, you definitely want to rule out (laryngeal) throat cancer. “Throat cancer is a very serious condition requiring immediate medical attention. Chronic hoarseness warrants evaluation by an otolaryngologist to rule out laryngeal cancer,” says the American Academy of Otolaryngology–Head and Neck Surgery (AAO-HNS). So if you’re having chronic issues with your voice, it’s imperative to seek medical attention. But there is also a lot you can do on the preventative side if you do not currently suffer from voice issues. And Not Surprisingly, Nutrition is Key. If you are educated about your nutrition and eat healthily, you can significantly reduce your chances of having all sorts of diseases including cancer, diabetes, dementia, depression and cardiovascular disease. And although a big part of eating right is eating plenty of fresh fruits and vegetables, and eating junk foods in moderation, an invaluable piece of the puzzle is making sure you know your nutrients and that you are getting appropriate amounts of each and every one of these nutrients. There are also specific nutrients, according to the NIH, that may help protect your voice. The following nutrients are powerful antioxidants and may help keep the mucus membranes that line the throat healthy. Vitamin A. You can find vitamin A in foods like sweet potatoes, carrots and pumpkins. Vitamin C. Foods rich in vitamin C include citrus fruits like oranges and grapefruit. Bell peppers are also a great source of this vitamin. Vitamin E. You can eat sunflower seeds, almonds, spinach and broccoli to get more of this vitamin in your daily diet. In addition to this, these nutrients help in maintaining a strong immune system which is imperative if you want to avoid voice-robbing illnesses like laryngitis. And Don’t Forget the Minerals! There’s a reason why I say minerals are the forgotten nutrient. When was the last time you thought about your intake of selenium, for example? Read here to learn about minerals that may help protect your immune system, and as a result, your voice. When it comes to your voice as well as your health, water is arguably the most important nutrient of all. It is, after all, the only nutrient that we cannot live without for very long - usually no more than a few days. Just think, Gandhi went 21 days without food. He would not have survived that long without water. Staying hydrated helps keep the vocal folds and larynx moisturized which may also protect you from losing your voice. Despite how healthy you may be eating and how much water you may be drinking, it is difficult to know if you are getting a balanced amount of the nutrients you need to maintain your voice and stay healthy, without periodically doing a comprehensive nutrient test. A proper nutrient test will identify imbalances and allow you the opportunity to work with a competent healthcare professional to tweak your diet as appropriate. Don’t just use your voice, protect it.